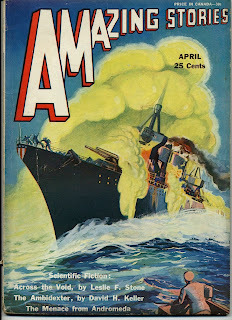 An examination of seven films starring Humphrey Bogart made just prior to or during World War II. Themes of self-sacrifice, service to others and confronting evil run through all these films--themes that are still viable and important today. Here it is for the Nook. Sgt. Preston must drive his team of sled dogs through a blizzard with almost no supplies in order to deliver a dangerous prisoner to jail. Like the other shows that originated at WXYZ in Detroit (The Lone Ranger & The Green Hornet), the best Sgt. Preston episodes were models of clear and vivid storytelling. This is one of my favorites. It keeps you engrossed from start to finish. 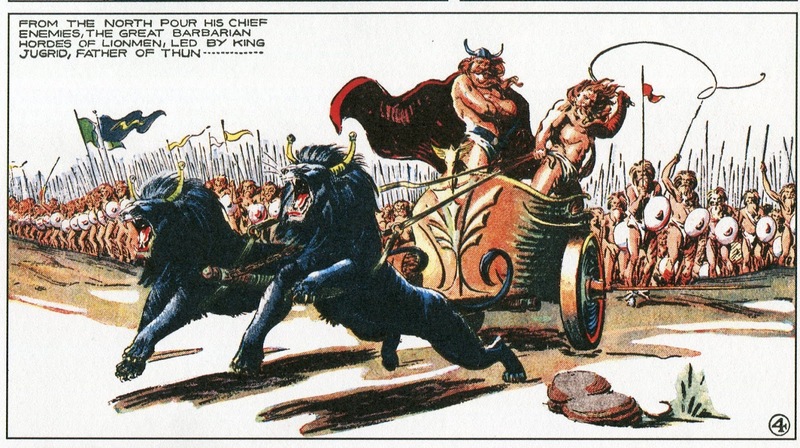 It also teaches you an important lesson—DON’T ever mess with Preston’s lead dog King. That never ends well. 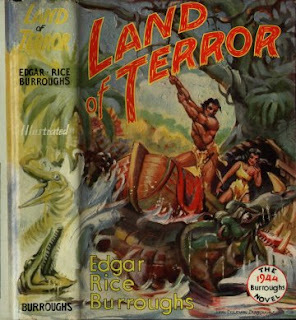 Edgar Rice Burroughs wrote Land of Terror with the intention of serializing it, but none of the magazine editors who normally snatched up his stuff were interested. 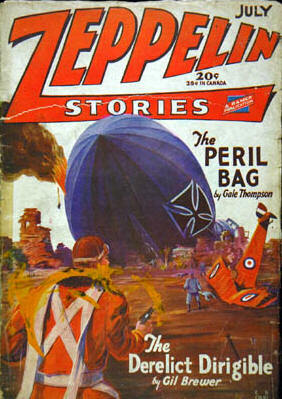 It was eventually printed as a book in 1944. 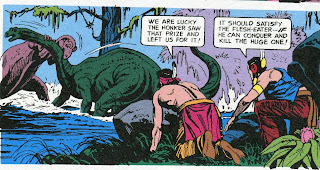 Burroughs’ longest series was, of course, the perpetually popular Tarzan. I’m pretty sure Burroughs could have written a novel in which the Lord of the Jungle spends the entire plot trying to teach a tribe of apes how to play Yahtzee and he STILL would have found a buyer for it. 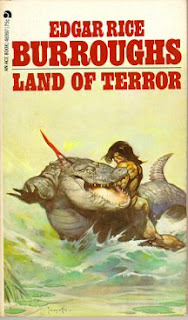 But Land of Terror couldn’t find a home in the pulps. I can understand why. Though the novel as a whole is still entertaining, a few of the individual sections were poorly developed and there are several annoying anti-climaxes at the end. The book picks up where Back to the Stone Age left off. 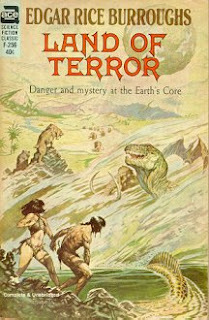 David Innes (returning to center stage as protagonist and narrator for the first time since Pellucidar) is returning home with the expedition that located the badly lost von Horst (hero of the previous novel). 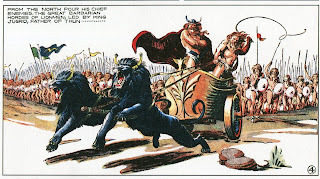 The party is attacked by a tribe of bearded women and David is captured. His allies think he’s been killed, leaving him pretty much on his own. He soon escapes from the tribe of bearded Amazons, then gets captured by a tribe consisting entirely of insane people, all of them suffering dysfunctions that range from delusions of grandeur to severe hypochondria to random maniacal behavior. Here he finds his wife, Dian the Beautiful, who had also been captured after a series of separate adventures. They escape, but get separated again. 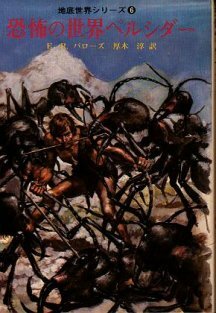 While searching for her, David gets successively captured by a tribe of ten-foot tall giants, a colony of giant ants; and a tribe that lives on a floating island. He escapes each time, though, and eventually gets home and reunites with Dian. All this is perfectly fine in terms of the basic plot, but—as I mentioned earlier—several of the mini-adventures are perfunctory and read as if Burroughs needed to do one more re-write before he was done. Notably, the bearded woman tribe and the giant cannibal tribe are just there to be weird—Burroughs does nothing (other than milk a few reverse gender role jokes) with these potentially interesting civilizations other than let them hold David prisoner for a short time before he escapes. Burroughs had a talent for building bizarre civilizations that have their own internal logic, but here he stops short of doing the job properly. 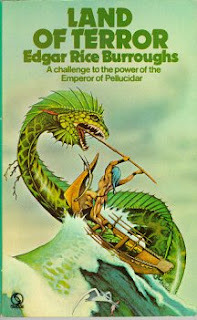 There’s a few other signs of laziness--as if Burroughs just wanted to get another Pellucidar novel out of the way so he could move on to something else. David learns that Dian is being pursued by an unwanted suitor, something that’s supposed to build up suspense as it means David now need to find her as soon as possible. But this backfires when, at the novel’s climax, we learn that Dian resolved this situation off-screen. Heck, we don’t even get to meet the bad guy. But the novel as a whole still manages to be fun. Burroughs generates some bizarrely dark humor out of David’s adventures in the village of crazy people, while the sequence in which he’s held prisoner by giant ants (and force-fed with regurgitated food by the ants) is genuinely creepy. Oh, well, I know I shouldn’t complain. Burroughs himself explained that he wasn’t a fiction writer, but a biographer, getting his information from people like Jason Gridley, John Carter and the guy who knew the guy who knew Tarzan. So if David Innes has an adventure which isn’t quite as interesting as his previous ones, we really can’t shoot the messenger because of this, can we? One of Pellucidar book to go and then we’ll move on to something else for the literature section of our Read/Watch ‘em in Order series. The Mad Thinker is up to his old shenanigans once again. He’s ambushing the FF one by one and replacing them with androids. But Reed Richards manages to get the best of his android and poses as that artificial duplicate until he gets a chance to attack the other androids. He links up with Ben and the two put the kibosh on the FF androids and the Thinker, rescuing Johnny and Sue in the process. This issue is a fine example of what a single-issue story should be—pure fun with great visuals. Watching Reed and Ben battle “themselves” is a real pleasure. Also, for no real reason at all, I like the fact that the FF and their android doubles are in civilian clothes rather than their uniforms during the battle. There’s not a lot else to say here. The story isn’t particularly deep or complicated, but it doesn’t have to be. It’s just plain, simple fun. And here we have another example of a great single-issue story, though this one plays off of Peter’s continuing character arc quite effectively. 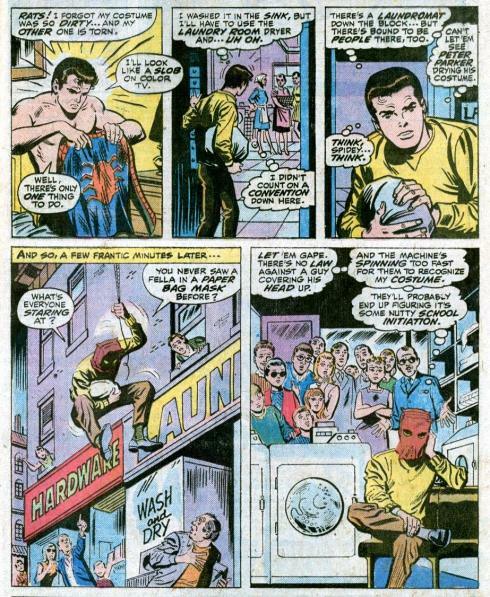 Pete’s feeling down in the dumps about his various problems, most especially that he had to convince Aunt May she was seeing things when she saw the web dummy in his bed last issue. He’s also worried about his lack of money and his inability to properly wine and dine Gwen. So, on a whim, he swings into the office a network executive and offers to appear on a talk show that night. There is, I suppose, a continuity error here. Peter already knows he can’t get paid without giving his real name, social security number and so on. That’s what happened when he tried show biz back in Spider Man #1. In fact, the problem is acknowledged in this issue, but is glossed over with a joke and not mentioned again. But this is a strong enough issue to make us forgiving. Max Dillon, aka Electro, is working as an electrician at the studio while he’s on parole. He cuts a deal with Jameson to unmask Spider Man on the air. This leads to a fight that pretty much ends in a draw, but ruins Peter’s chances to make some extra cash. The fight scene is a typically good one in terms of visuals, but it’s the character moments that make this issue notable. Peter’s problems all make sense in context to his life as a super hero, but still keep him grounded as a human being we can relate to. 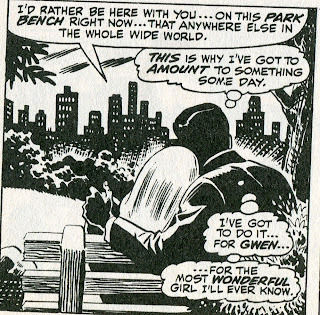 His scenes with Gwen, in which she tells him she doesn’t care that he’s broke, are legitimately sweet. 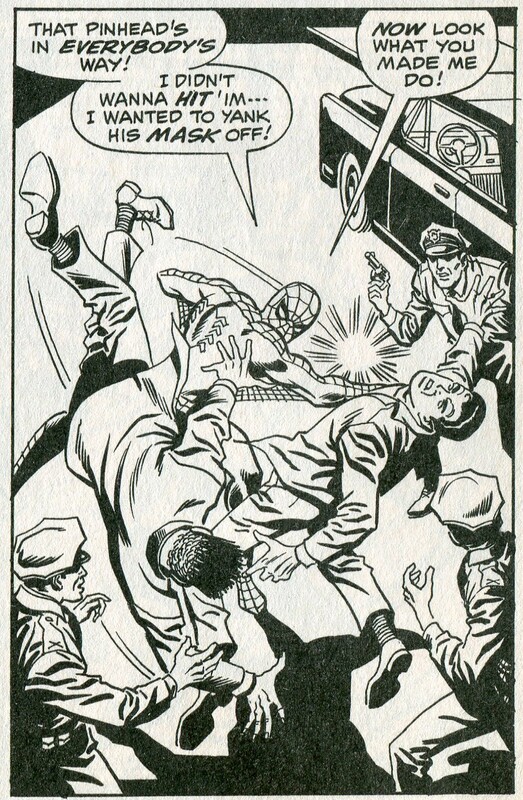 There's also a panel that might just be the single funniest gag ever to appear in Spider Man. Peter needs to wash his Spidey suit before his TV appearance. So as to not giveaway his secret ID, he wears a bag over his head while at the laundry-mat. 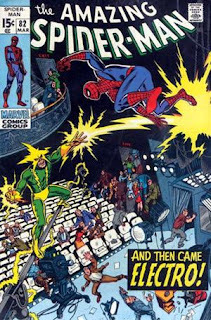 I also like Electro’s characterization. He’s presented as angry with the world and thinks the worse of everyone as he just waits for an opportunity to jump back into action as Electro. 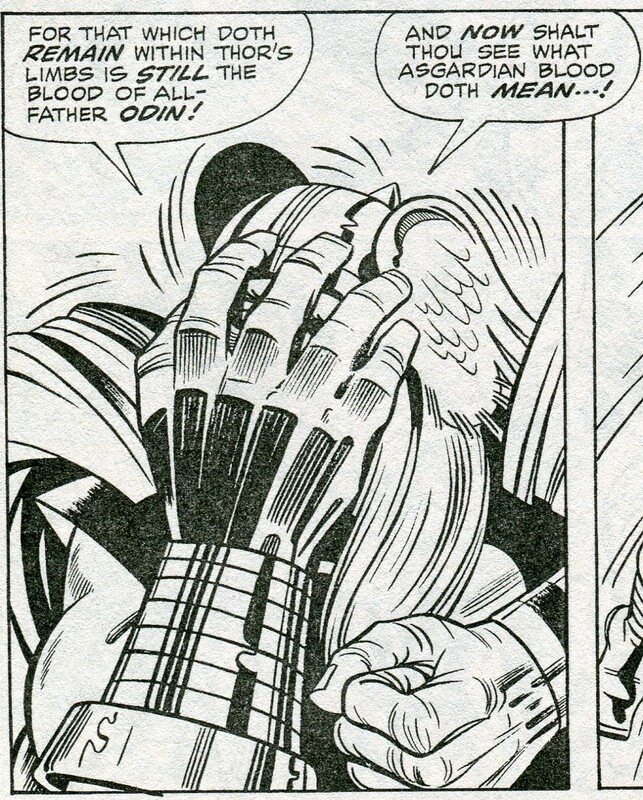 But Stan Lee does some subtle characterization here. Though it’s not emphasized, we do see that Dillon has gotten a good job and seems to have the respect of his peers. His parole officer seems to be supportive of him. But he’s blind to all this—thinking of them all as “smug jerks.” It’s a nicely done and effective characterization of a man who’s perceptions of those around him are skewed by bitterness. After I spent so much time in the last Marvel entry whining about what I thought were mediocre issues, I’m glad I can give three thumbs-up in a row this time around. 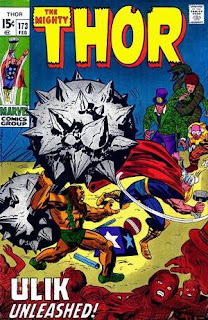 The Thor story is another single-issue affair in which a young scientist has his theories mocked by the established scientific community and decides to take a trip to Crazy Town. 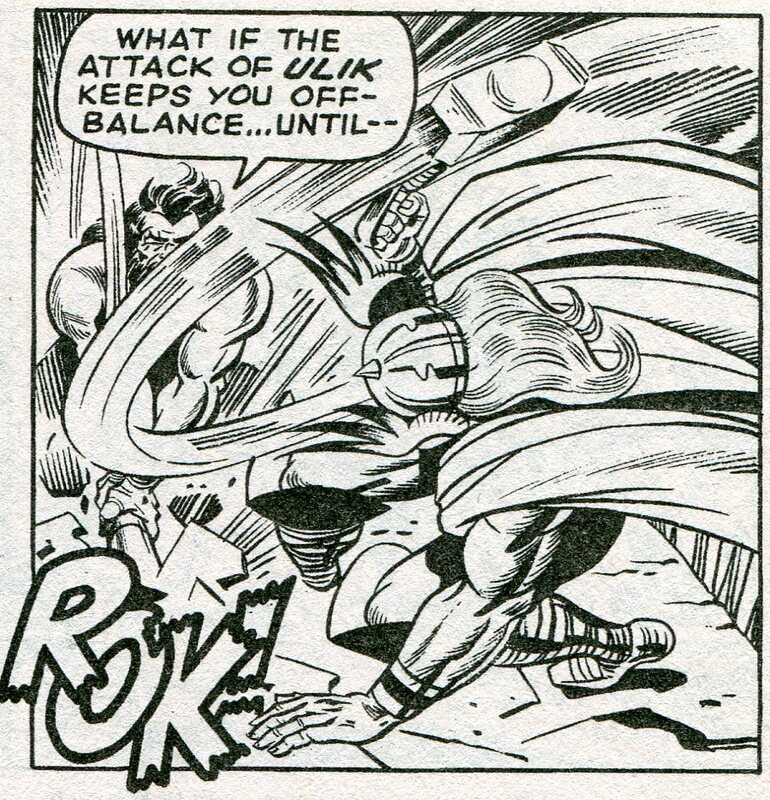 To prove his theories, he knocks Thor out with a hypno-beam, then uses another device to draw out half of the Thunder God’s strength. He transfers this strength into a robot called the Crypto-Man and sends it on a rampage. 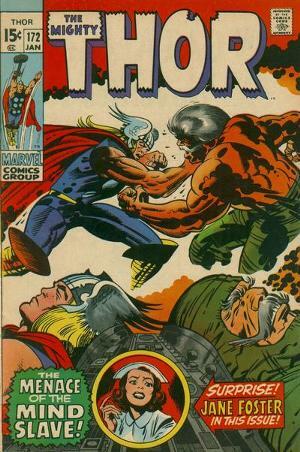 Thor fights the robot, but with half his strength given to his opponent, he’s not able to defeat it. But when the robot breaks into a nuclear reactor and becomes a threat to the entire city—including the scientist’s elderly mother—the scientist has a change of heart. He deactivates the robot, sacrificing his life to do so. Yes, it’s corny and even at the time not that original. 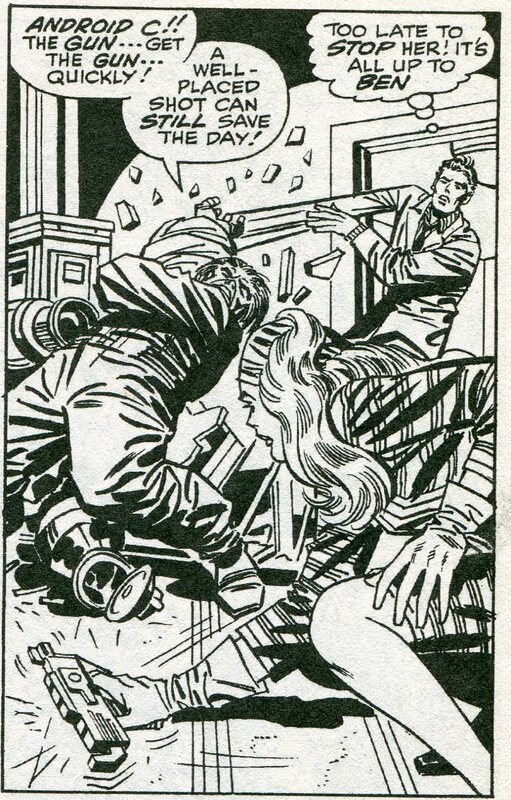 But Kirby (of course) makes it look great and the final panel—in which Dr. Blake tells the scientist’s mom he died a hero—is touching despite its corniness. That’s it for March. Next week, we'll tour Europe with the Haunted Tank. In two weeks we'll look at April 1970, in which the FF fight a monster who may not be a monster; Spider Man encounters a new villain; and Thor discovers there’s been a change in leadership back home in Asgard. The setting for this story—based on a short story by Theodore Sturgeon—is a space station above Earth that serves as an embarkation point for those who will colonize other planets. This is the set up for a study of several characters—some likeably and some not so much—in what becomes a very sweet and human tale. For those of us who tastes gravitate towards older films, many of the character actors of Hollywood’s Golden Age become reliable friends—people we enjoy seeing in a movie even if that movie is only so-so. That was the case in Dakota, the Western I wrote about a few weeks back. The presence of Mike Mazurki, Ward Bond and Walter Brennan in that film adds to its appeal even beyond consideration of how well they play their roles. We just like hanging out with these guys. It kind of makes up for the fact our real-life friends are all mind-numbingly boring. 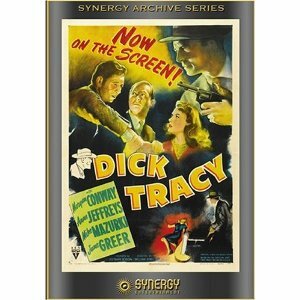 Anyway, the 1941 B-movie Mr. District Attorney contains another visit from an old friend. Peter Lorre is there, playing a small but important role as one of the bad guys. The movie is an odd one. It’s supposedly based on the then popular radio show of the same name. But whereas the radio show was a straightforward procedural, the movie is almost a screwball comedy. 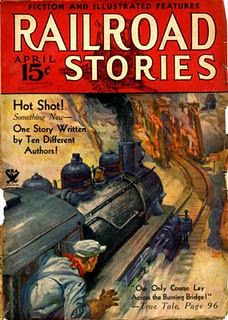 The main character is P. Caldwallader Jones, a young lawyer hired by the D.A.’s office because he has an influential uncle. He and spunky (and really cute) girl reporter Terry Parker stumble their way through a case involving murder and corruption until—pretty much by dumb luck--they nab the crooked lawyer who is running the local rackets. Lorre is an embezzler who’s been in hiding for years, sitting on some hot money and enough evidence to break the rackets. To cover his trail, he bumps off a couple of people. As Ron Backer points out in his excellent book Mystery Movie Series of 1940s Hollywood, Lorre’s scenes seem almost disconnected from the rest of the film. Whenever he shows up, the mood of the film abruptly switches from comedy to film noir, both in mood, in staging, and in lighting. It’s almost jarring. But what the heck. The movie is flawed in this regard, but it’s still a fun little film. 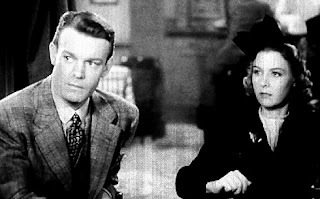 Dennis O’Keefe and Florence Rice play the two leads and bring a fair amount of charm to their roles. Sarah Edwards is great as Miss Petherby, the District Attorney’s “doesn’t take any guff from her boss” secretary, while Charles Arnt is perfect as a wimpy bank clerk who unwittingly embezzles from an embezzler to get money to spend on his burlesque-dancer girl friend. 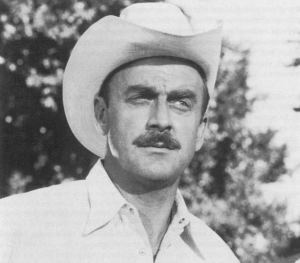 Arnt, in fact, was often cast as a wimpy or hen-pecked man throughout his career. He’s really just another of the many old friends we meet when we come to appreciate the films of this era. If he’s in a movie, then it automatically gets some points in its favor regardless of its faults. So—if any friend of mine IS reading this: That’s how you can finally become interesting. Just emulate Peter Lorre. Or Mike Mazurki. Or Ward Bond. Or Charles Arnt. Heck, with so many choices, you really have no excuse for being mind-numbingly boring, do you? I've added another video to my Pulp Era Story Reviews YouTube channel. The FF is called on to act as bodyguards to a U.N. peace commission. But a villain called the Monocle (because he’s a guy who wears a monocle) is planning on using the death ray built into his camera to kill the commission members. That would start World War III, with Monocle and his followers sitting out the festivities in underground bunkers, ready to rise up and take over later on. This all leads into a pretty hum-drum issue. 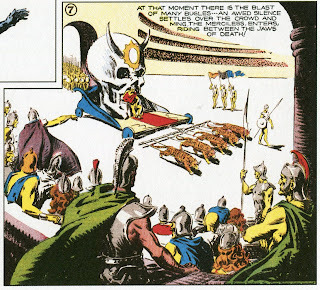 The villain is as generic as can be and his plan is the same sort of plan that many other mad scientist/world conquerors have tried to carry out in a zillion or so works of fiction. And there’s nothing really original or striking about Monocle’s visual design. 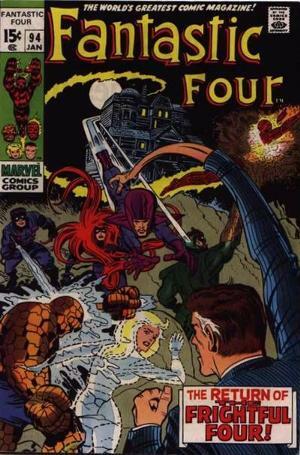 Any way, the bad guy uses his death ray to distract the FF with various disasters while he then kills the U.N. guys. But Reed deduces the sort of technology he’s using and counters it, allowing the heroes to save the day and run the villain to ground. Also, Crystal is temporarily recalled to the Great Refuge by Black Bolt, while Sue takes an active part in this mission. It will actually take nearly a year’s worth of issues to wean Crystal off the book completely and return the FF to its original membership for a time, but this marks the beginning of this process. It’s simply not that great a story. 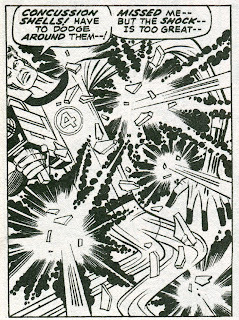 But still, it is Jack Kirby doing the art, so it looks fun. As I believe I mentioned in an earlier entry, I believe Kirby was far too professional to ever put in less than 100% effort into anything he did. So I doubt his rapidly approaching departure from Marvel was the reason for this hum-drum issue. I think he and Stan just had an off month. But, well, the Kangaroo just isn’t that great a villain--being a bit… hum-drum. He’s a guy who spent time in the Outback living with kangaroos until he developed the muscles and skills to jump high and far. I guess this does highlight how oddly the Suspension of Disbelief kicks in for each of us as individual readers. I can accept a lab accident that gives someone control over four artificial arms; I can accept a serum-gone-wrong that turns a scientist into a giant lizard; I can accept a man who can turn himself into sand. But, gosh darn it, a guy who lives with kangaroos until he learns to jump real good? That one just bothers me. Well, the Kangaroo has fallen into a life of crime and is now in New York. He steals a container being transported under guard, assuming its cash. It turns out to be a vial of deadly experimental bacteria. In the meantime, Peter is having some typically bad luck. Aunt May is back from Florida. When Peter picks her up at the train station, he’s overheated from webslinging to get there on time. May assumes he’s catching cold, so she takes him back to her home and puts him to bed. Peter has the good grace to allow her to mother him and, in a legitimately sweet moment—decides to go along with “having a cold” for a few days to allow her to take care of him. But when he learns that the Kangaroo is loose with a vial of bacteria (and probably doesn’t know it), he leaves a web-dummy behind in his bed and swings off to locate the villain. While he’s gone, Aunt May comes in, sees the dummy and faints. 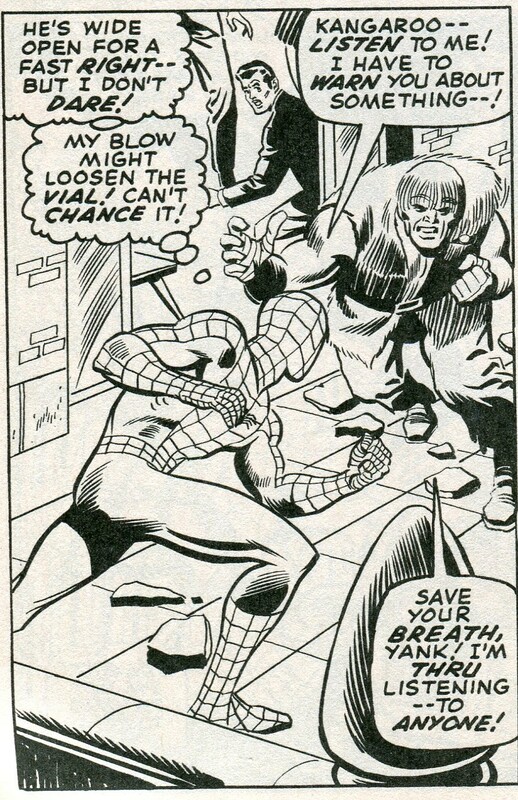 While Aunt May is having conniptions, Spidey has a fight with Kangaroo, made interesting by the fact that Spider Man can’t risk throwing a solid punch without breaking the bacteria vial. The villain may be hum-drum, but the situation makes the fight an interesting one. Spidey lets Kangaroo slip away, but only after he recovers the vial. By the way, John Romita is back in this issue, though he’s sharing the art chores with John Buscema and Jim Mooney. The credits don’t make it clear who is doing what (layouts, pencils, etc), but the art still looks great. 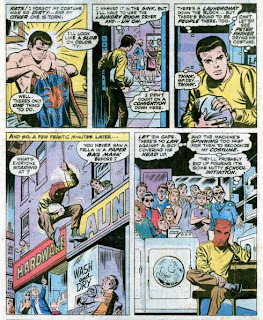 Romita will continue to share the art duties with Mooney or others for awhile before Gil Kane comes aboard for a brief run. Then Romita will return as the primary artist in issue #106. 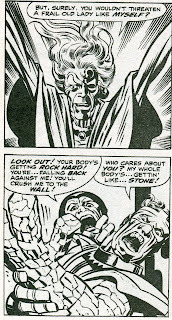 Gee whiz, Marvel has some great artists at the beck and call during these years, didn’t they? This issue ends with Aunt May thinking she must be going senile and Peter unable to give an alternate explanation. I’ve complained a little about Aunt May from time to time, but I do recognize her importance to the Spider Man mythology and here she’s being used effectively. Peter was using his powers responsibly and with courage, but his need to keep his secret identity continues to inadvertently harm those close to him. Well, I’m glad I don’t have to whine about this issue. 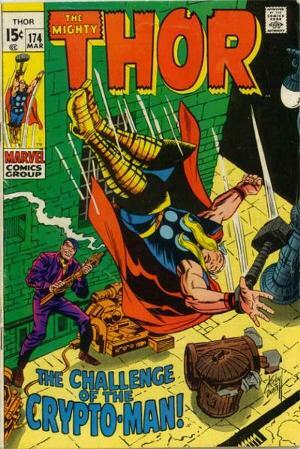 Though it’s not up there with the true classic Thor stories, it’s still good, solid entertainment with nifty visuals. The Circus of Crime is out on parole and they are still working as a circus as a cover for their robberies. 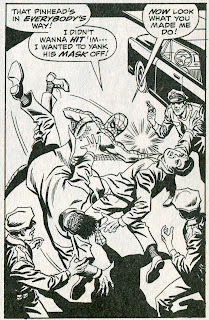 They were, by the way, out on parole the second time Spider Man fought them. You’d think by now that a condition of their parole would be “DON’T WORK AND TRAVEL TOGETHER AS A CIRCUS! “ Gee whiz, Marvel Universe judges seem to be as incompetent at the DC Universe wardens who always let Lex Luthor work in the machine shop. Since Thor was responsible for sending them up last time, he investigates them. 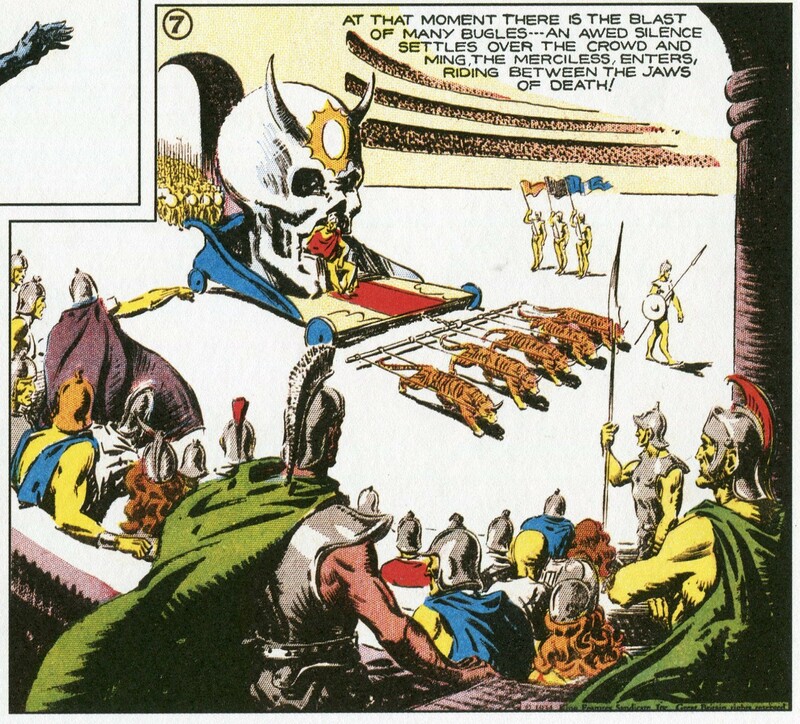 The story has some fun here—the current strong man act is a guy dressed as Thor, so the real Thunder God takes his place and then shocks Ringmaster with the “tricks” he’s able to do while performing. Thor has a brief fight with Ulik before zapping him back to the troll’s home dimension, while the human villains are all carted off to jail. 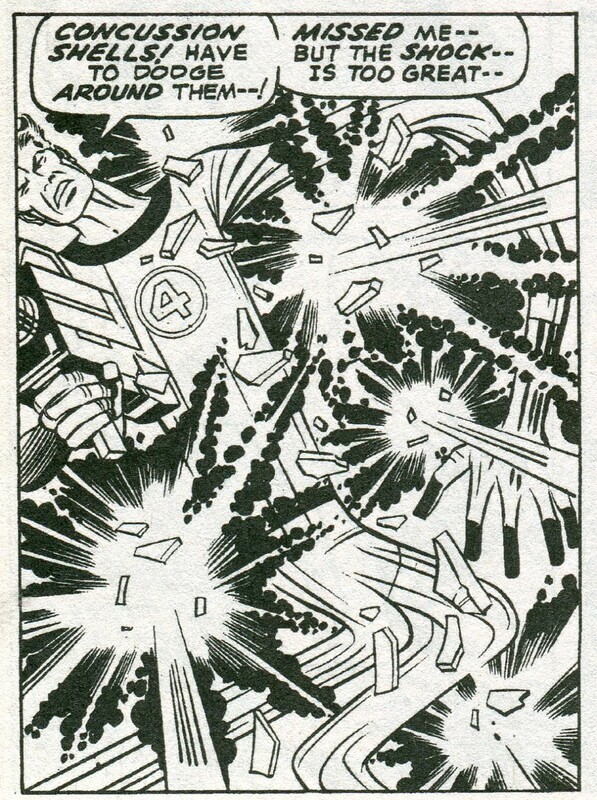 Kirby gives the whole set-up his usual visual panache. I suppose if I HAD to complain, I’d argue that the Thor/Ulik fight is far too short. This might have made a good two-parter. But it’s still a lot of fun the way it is, so I’ll refrain from complaining. I think I might have maxed out my Complain Points for this week anyways. That’s it for now. Next week, we’ll enter March 1970, where the FF will fight an old enemy; Spider Man will fight an old enemy; and Thor will fight a brand-new enemy. At the risk of being overly obnoxious, I am going to use Saturdays to publish a link to one of my books or ebooks. Sam is hired by a scientist to investigate a patent infringement. Trouble comes in two ways. First, the scientist just might be nuts. Second, someone starts blowing up those involved in the case with time bombs. It’s all so nuts that even Sam briefly gets committed. The sound on this one is a little whobbly in a few places, but it’s such a fun episode I’m posting it anyways. Here's a video I made for the library at which I work. I hope to one day manage to get through 4 minutes of narration without stumbling over a sentence, but I haven't quite managed it yet. Seriously. If the planet Mongo ever builds a hotel and invites tourists, who WOULDN'T pay good money to ride on some of these vehicles? Of course, PETA would protest the use of animals and mess it all up for everyone anyways. I see your secret elephant graveyard and raise you a secret DINOSAUR graveyard. The idea of a secret elephant graveyard—a spot where elephants all go to die when they get old—is an old legend that’s been used a number of times in adventure fiction. But in Turok, Son of Stone #65 (April 1969), the idea is taken one really, really cool step farther when Turok and Andar become involved in finding a secret dinosaur graveyard. The two Indians are carrying out their never-ending search to find a way out of the Lost Valley when they witness an epic battle between a T-Rex and a brontosaurus. The big sauropod drives off the flesh-eater, but it’s wounded and bleeding—obviously doomed. 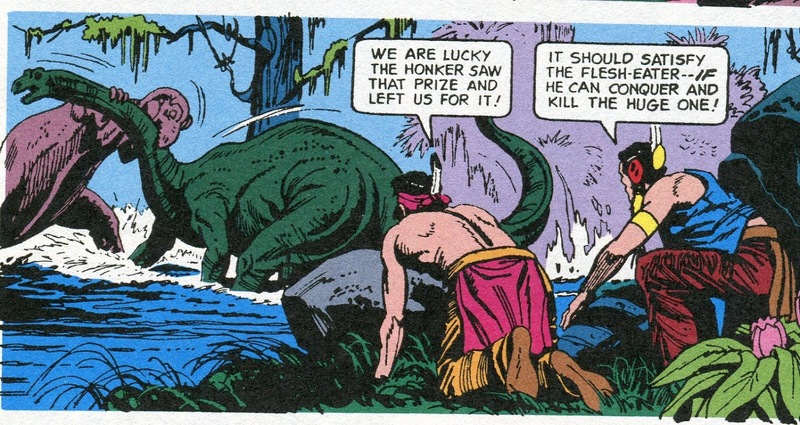 When the brontosaurus wanders off, Turok begins to think about how they never see all that many skeletons of dead “honkers.” Do they all wander off to the same place to die? If so, is that burial ground perhaps outside the valley? So Turok and Andar begin tailing the brontosaurus, encountering various dangers along the way and even helping the dinosaur out when it’s attacked by a flock of pterodactyls. But when a tribe of cavemen block the pass that presumably leads to the burial ground, the brontosaurus gets away from them. 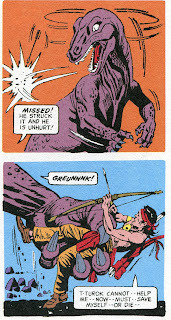 Turok comes up with a bold plan to get through the pass—a plan that involves ticking off a hungry allosaurus. 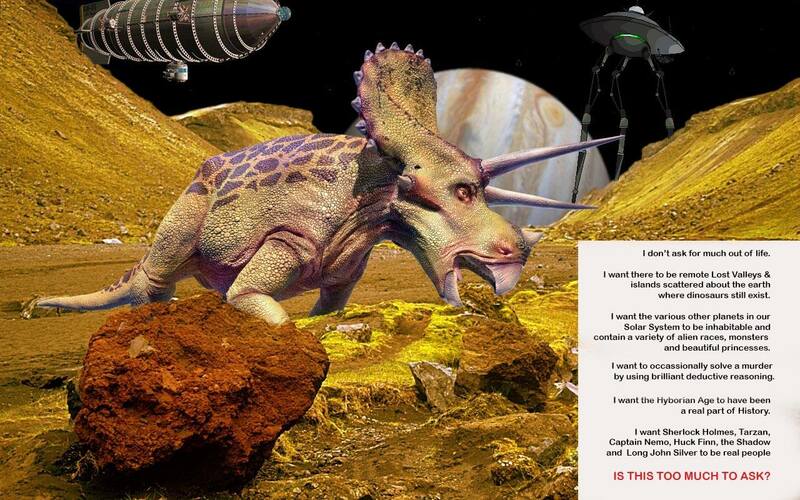 This gains them entry into what does indeed prove to be the dinosaur graveyard (though not exactly a graveyard). But when Turok is badly injured, it’s up to Andar to single-handedly fight an angry flesh-eater and deduce exactly how to save his friend’s life. 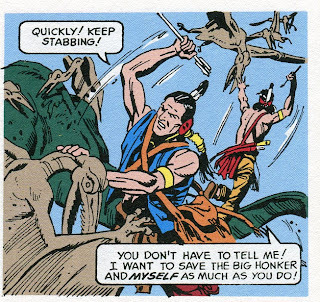 The best Turok stories from the Gold Key era involve Turok thinking his way out of dangerous situations—using his brains as well as his skill with a bow to stay alive. This particularly strong story has all that, but climaxes with the much younger Andar on his own, being forced to exhibit the traits of courage and cleverness that his mentor has always demonstrated. Adding to this are the imaginative visuals. We start with the fight between two large dinosaurs and end with a human vs. allosaurus duel amongst the huge skeletons of the dinosaur burial ground. In previous posts, I have often been a little critical of the interior art in Turok. But as I revisit these stories through the Archives series now being published, I find myself more and more appreciative of the sheer level of imagination that was shown between the covers of those wonderful comic books. Besides—a secret dinosaur burial ground? That idea alone makes the whole series worthwhile. When I was in the Navy, nothing this interesting ever seemed. to happen. Which, I suppose, is just as well. Both X Minus One and its predecessor Dimension X had a nice habit of mixing in an occasional humorous science fiction story into usual more serious line-up. This one involves an intelligent mutant mouse who lives at a research facility. His complaints about a mouse trap set up right outside his home starts a series of events that might just end with the collapse of civilization. 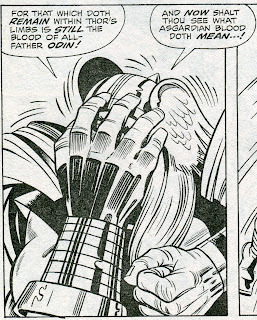 I have no idea if this means anything, but this is Jack Kirby’s last year on FF and Thor (he’ll be gone before the end of 1970) and, as his tenure on these books nears an end, both go into a long string of single issue stories. That’s not a complaint—the individual stories we see in both books will be very good. But it is interesting to take note of this. As he made a decision to leave Marvel, did he consciously stop plotting extended story arcs? I have no idea. Anyway, this issue of FF shows Reed and Sue finally deciding on a name for their son. And it’s about gosh-darn time. In real life time, the kid’s over a year old. 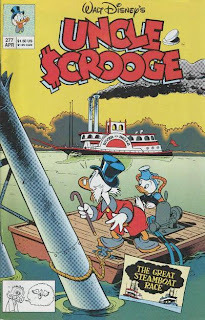 But, of course, this is comic book time, where he likely hasn’t been around more than a few weeks. His name, of course, is Franklin Benjamin Richards (the Franklin from his grandfather and the Benjamin from his godfather). And his parents decided to find him a nanny in the remote town of Whisper Hill to keep him safe. 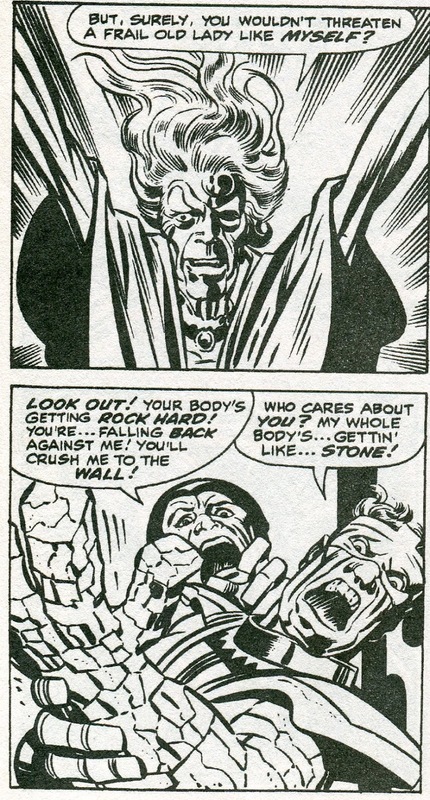 This leads to the introduction of one of the more interesting supporting characters in the Marvel Universe. The elderly Agatha Harkness seems like your average, everyday extremely creepy old lady, but she is in reality a powerful witch. This is something that comes in handy when the Frightful Four attack Agatha’s home and manage to capture the Fantastic Four. Medusa has rejoined the villains, but its no surprise that she’s working undercover and attempts to jump the bad guys herself. She’s also captured. 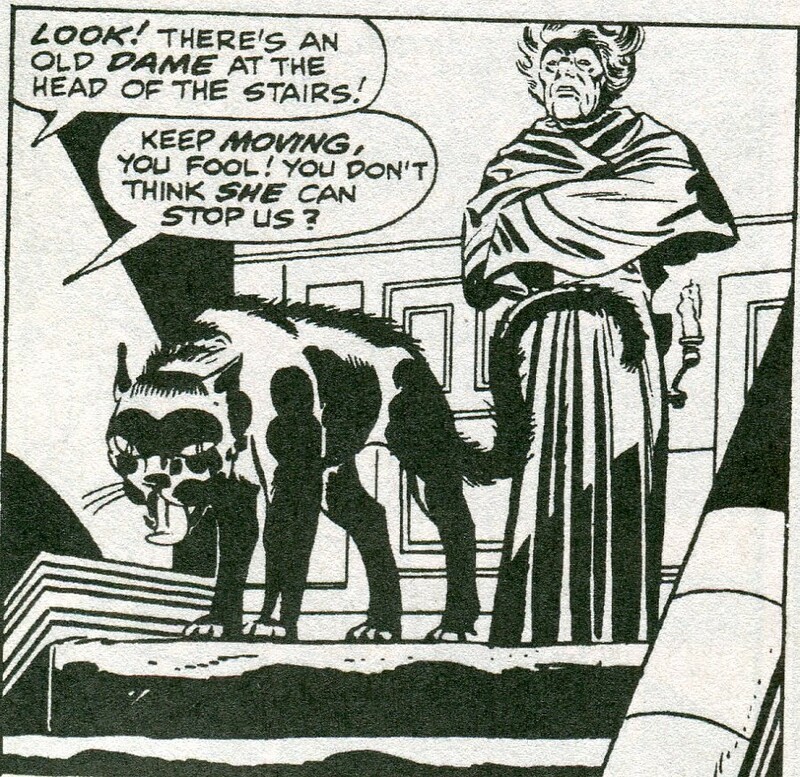 But then the Wizard, Sandman and Trapster encounter Agatha, who quickly whips up some bizarre magic and pretty much hands them their butts without even working up a sweat. 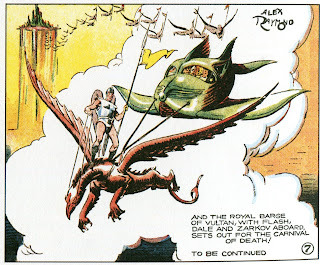 It’s yet another story (like the alien/gangster story arc that just ended) that gives the impression Jack Kirby was really having fun with the art. It’s a nifty story, full of bizarre visuals and quirky humor. Gee whiz, The Amazing Spider Man is entering a phase of single issue stories as well. 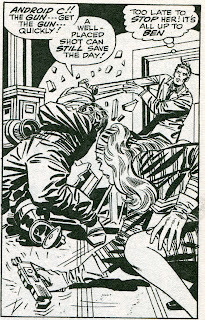 And there’s no “Jack Kirby is leaving soon” excuse available here. 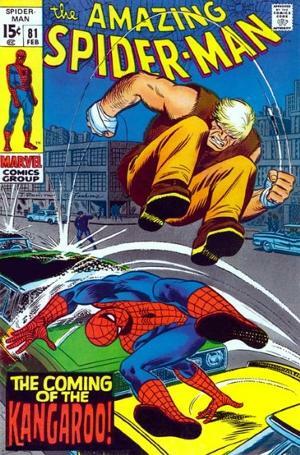 On the other hand, John Buscema’s run on Spider Man is relatively short before John Romita returns, so maybe that was a factor. Anyway, Peter doesn’t fair quite as well in this story as the FF and Thor do in theirs. 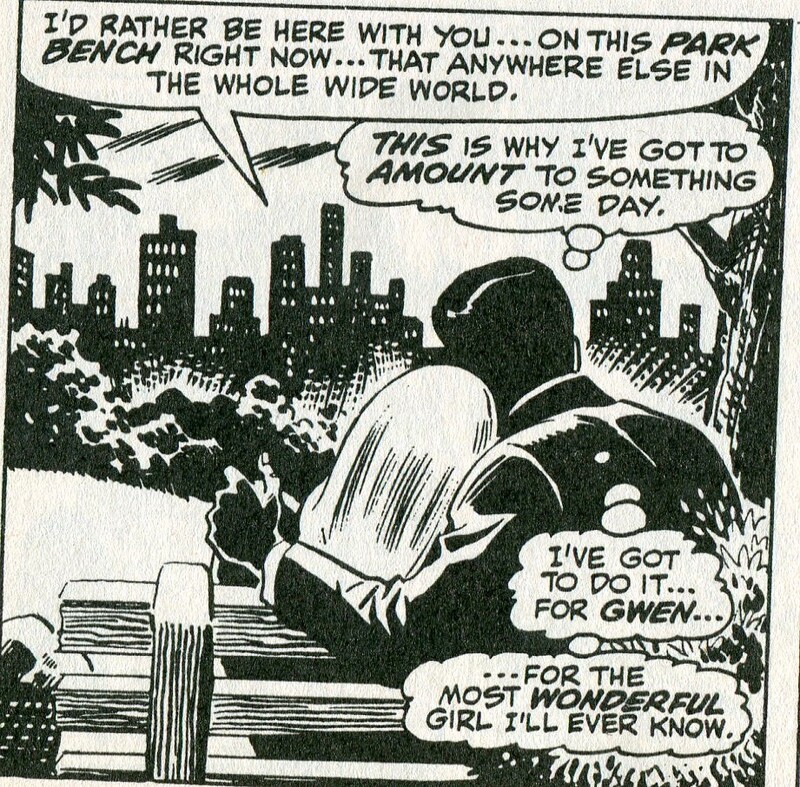 Peter finds out he’s been a jerk in thinking Gwen is stepping out with Flash Thompson. Pete and Gwen make up, then it appears that Gwen’s dad has stolen some valuable paintings. Peter deduces that the real crook must be the Chameleon and gets Joe Robertson to give a meeting about a large bond transfer a front page mention, hoping to smoke the villain out. 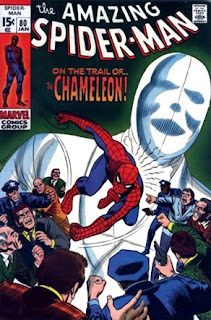 The plan seems to go awry at first, but when the Chameleon tries to use a Peter Parker disguise to escape with the bonds, Spider Man somehow catches on to him. It’s not a bad story, though Spidey’s plan to catch the bad guy really isn’t a very good one and seems too much like a plot contrivance than a natural outgrowth of the plot. Still, the art is quite good and Peter’s scene with Flash, where Peter finds out he’s been acting like an idiot regarding the girl he loves, is nicely done. Like Fantastic Four and Thor, Spider Man at this time is so good, that a merely average story sticks out like a sore thumb. A millionaire named Kronin Krask is dying. He kidnaps Jane Foster get a hold over the doctor she now works for--and with whom she’s fallen in love. Gee whiz, Jane, falling in love with EVERY DOCTOR YOU WORK FOR really isn’t an emotionally healthy habit. Do you actually put stuff like this in your resume? And knowing that she’s prone to getting kidnapped, does she arrange for her time has a hostage to be on the clock? Krask’s plan also involves luring Thor to his heavily guarded mansion and knocking the Thunder God unconscious with a hallucinogenic mist. 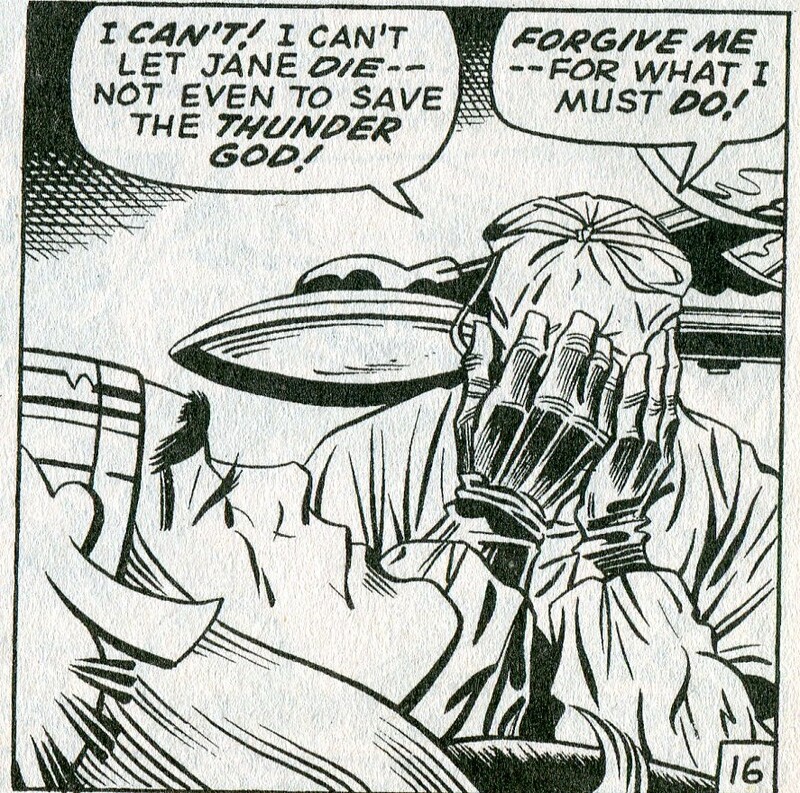 He plans to force the doctor to transfer his mind into Thor’s body. 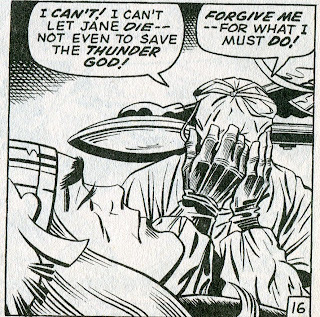 Thor actually lets himself get captured so that he can meet the challenge of having someone try to take over his mind. He wins the battle of egos, of course, freeing Jane and her boss live happily ever after. 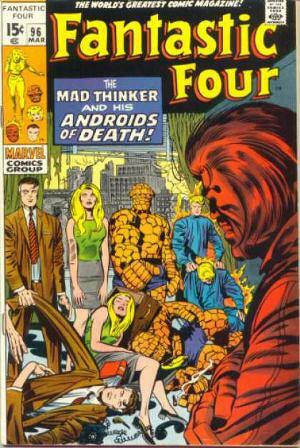 Even though the plot in this issue is a little heavy handed, Kirby’s visuals make this another fun story. 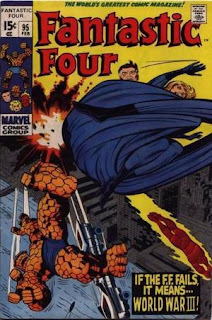 In fact, for me, both this story and this month’s FF have a late 1950s Tales to Astonish vibe to them, as if Stan and Jack were channeling some of the monster and weird menace tales they did back then into the superhero genre. That’s it for the premiere month of 1970. 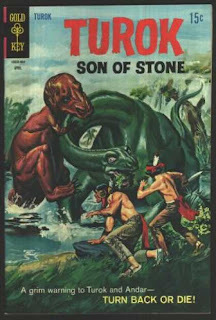 Next week, we'll pay a return visit to the Lost Valley, where we'll check in with Turok and Andar. Then, in February, the FF prevent World War III; Spider Man fights a vaguely annoying new villain; and Thor goes to the Circus. 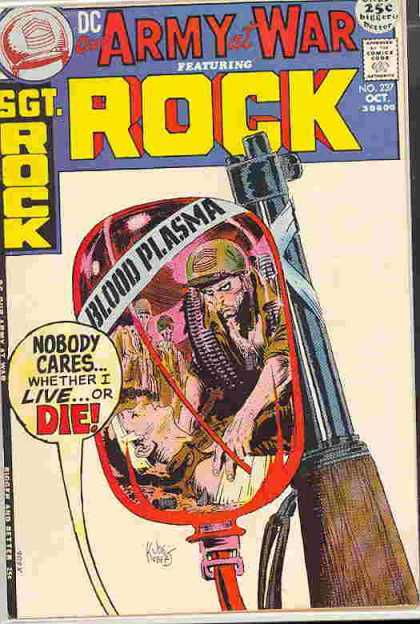 One of Joe Kubert's most evocative and emotional Sgt. Rock covers.